Some of the most covetable Hendersonville vacation rentals are situated on the pristine riverfront property of The Horse Shoe Farm. Over eighty acres of manicured pasture is surrounded by spectacular views of the nearby Appalachian Mountains. In addition to a selection of stables and event venues, the farm also features a variety of luxury vacation homes. 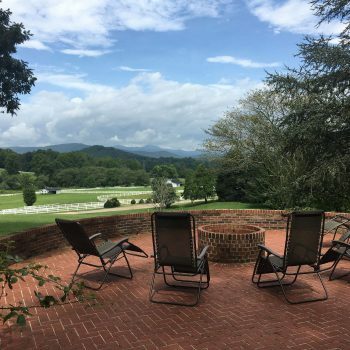 Whether you’re interested in a quiet weekend getaway in a cozy cottage, or a bustling family vacation in an expansive manor, The Horse Shoe Farm has the Hendersonville vacation rentals you’re looking for. Located atop the highest point of Horse Shoe property, The Magnolia Manor boasts impressive views of the Mount Pisgah vista. An expansive brick patio and built-in fire pit invites guests to soak in the sights. But the refined décor and comfortable furnishings draw visitors back inside. The five-bedroom, five-bathroom home can comfortably accommodate up to twelve people. One of the most iconic buildings on the property, The Stable House is also one of the only Hendersonville vacation rentals that accommodates both people and horses simultaneously. The Big Sky Loft is an eclectic living space situated on top of a working stable. In addition to five spacious bedrooms and three bathrooms, the house also features an open living space and dining area. And the expansive second-story deck affords spectacular views of breathtaking sunsets. Nestled right in the heart of The Horse Shoe Farm is The Willow House, a three-bedroom home with 3,000 square feet of living space. The house is named for its proximity to a scenic pond that is lined with large, billowy Willow trees. Up to ten guests can stay at the house comfortably. With it’s lap siding, simple shutters and expansive front porch full of rocking chairs, The Meadow Cottage is an ode to the classic rendition of a white farm house. Set back in a secluded setting, the cottage is a great place to escape from the stresses of daily life and enjoy a simpler time. Large oak trees and lush landscaping create a private haven for guests staying at The Lily Cottage. The cozy home is ideal for a couple’s getaway, but the two-bedroom cottage can also accommodate small groups too. Staying at The Horse Shoe Farm offers so much more than typical Hendersonville vacation rentals. Explore our grounds, grab a bite at The Silo Cookhouse, or spend an afternoon on the banks of The French Broad River. A day at the farm has never been so relaxing. Contact us today to book your stay.